TAYLOR AND CONNER WERE WAY EXCITED FOR CHRISTMAS. CONNER WAS EVEN REQUESTING THAT PRESLEY SLEEP OVER AT MARY'S HOUSE, CAUSE IF SHE WOKE UP IN THE NIGHT CRYING, AND SANTA WAS THERE HE WOULDN'T LEAVE GIFTS BECAUSE HE WOULD THINK EVERYONE WAS NOT IN BED! WE ASSURED CONNER SANTA WOULD FORGIVE HER. 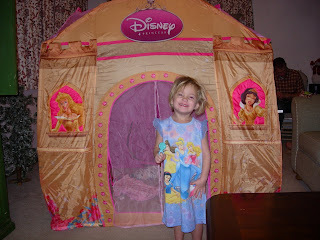 TOTS ASKED FOR A PRINCESS CASTLE AND SANTA DELIVERED JUST THAT, WITH PRINCESS PHOTOS ON IT AS WELL, SHE LOVES IT. 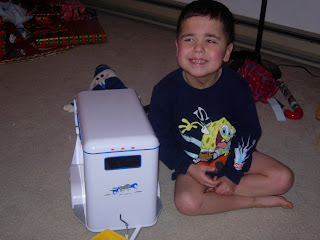 CONNER ASKED SANTA TO BRING HIM A BIG TRAILOR LOADED WITH HOARSE, AND ONCE AGAIN SANTA FOUND IT! WE MUST HAVE HAD A SUPER SANTA THIS YEAR! THE KIDS ALSO GOT BIKES, WE TRIED RIDING THEM IN THE SNOW, BUT IT DIDN'T GO SO WELL, SO WE'LL WAIT TILL THE WEATHER WARMS UP A BIT AND TRY AGAIN. THE KIDS ENJOYED ALL THEIR SWEET GIFTS. WE HOPE YALL HAD A GOOD ONE, HAPPY NEW YEAR!